PhD Student and other roles. With regards to the PhD I am doing, it is part of my purist to impart my knowledge and experience to others and contribute to the body of human knowledge. The survey was concluded a few months ago, I've extracted and analysed the results, written a draft paper on the results; I'm finally ready to publish my results. So off I went and learnt some more Python, science kit etc. and wrote some code to perform principal components analysis and functional analysis. I asked a friend, who has a Computer Science PhD and an A-level A in maths about functional analysis, and his reply was "an analysis of your functions? ", at which point I returned to reading more books on the topic. The survey page was taken offline by the hoster as their spam blocking blocks any mention of "'ac.uk" on any pages hosted by them. I told them they've cut off a good junk of the British academic community, to no avail. 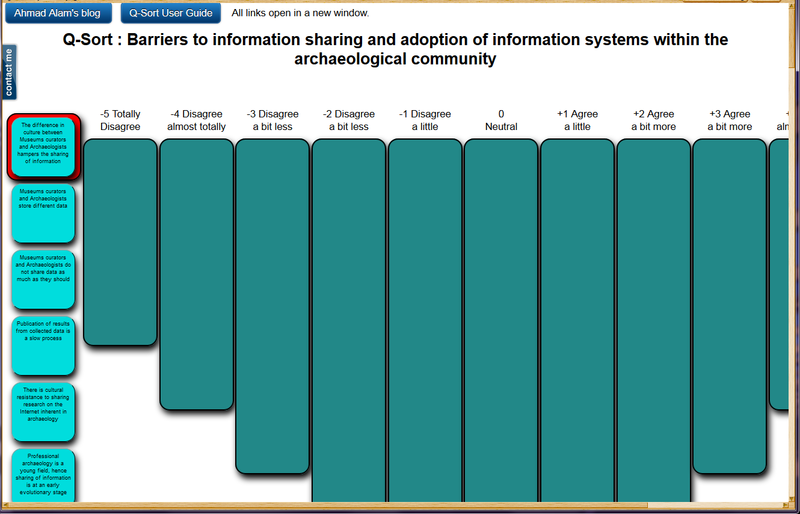 The Q-Sort Survey for Attitudes to Data Sharing within the Archaeological Community, is here. As promised, the Q-Sort survey for attitudes to data sharing within the archaeological community, is now ready and on-line. I've written a handy user guide, it's well worth a quick look, as it's unlikely to take more than three minutes to read. Why am I doing this, who am I etc? I’m a 2nd year Computer Science PhD. 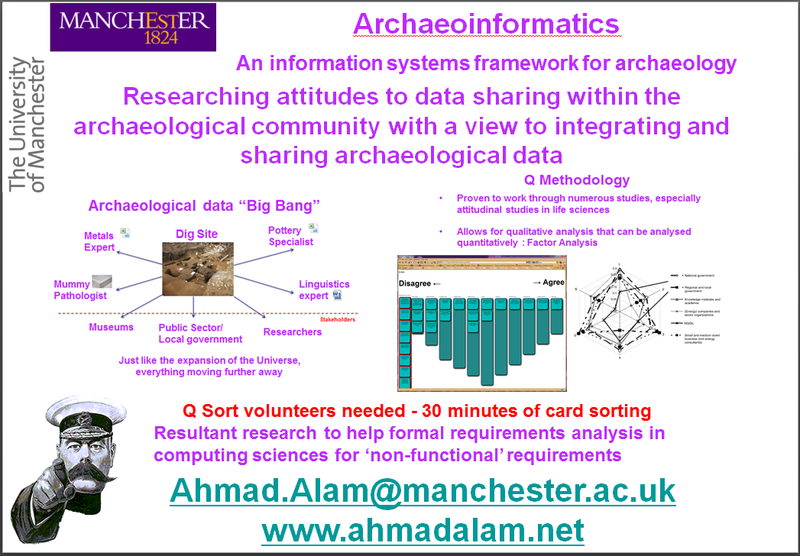 student at the University of Manchester researching attitudes to data sharing within the archaeological community with a view to developing tools for integrating and sharing archaeological data. To this end, having conducted semi-structured interviews, I have developed an on-line survey to identify issues that are acting as barriers to data sharing within the archaeological community. It is in effect a form of requirements analysis, but with a focus on non-functional requirements, such as governance, ownership of data etc. as opposed to functional requirements, i.e. 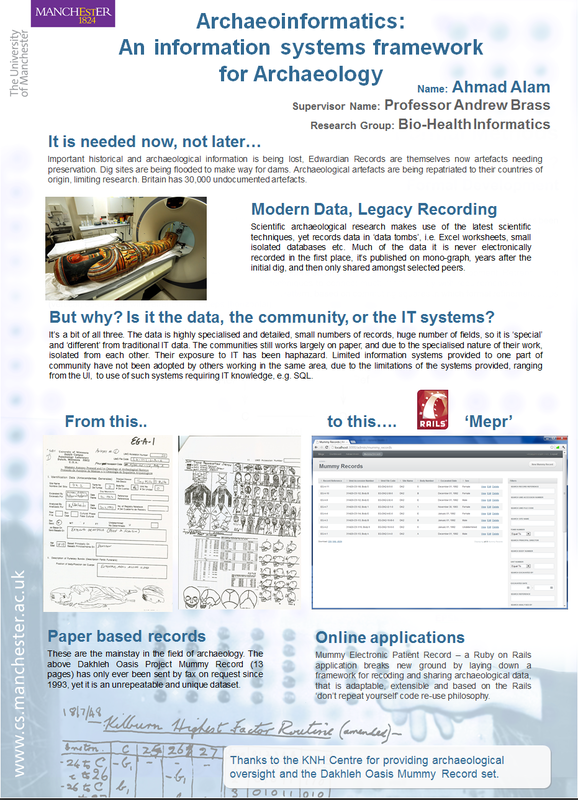 formats for capturing data, scope of a proposed system etc. Hence I have adopted Q-Methodology for the survey, which is a ‘subjective’ or qualitative survey technique the results of are then examined quantitatively, by means of statistical analysis. I'm only asking for your e-mail address in the survey, in addition to recording how the tiles are placed by you. You’ve reached this page because you saw my presentation at the Collaborative Workshop 2014 in Oxford, or by browsing the web, so in short, if you’re willing to be contacted to do an on-line Q-sort at some point over the coming weeks, then please register your interest; send me an e-mail via the box on the right window pane, or click on the ‘Contact Me’ button on the left, or just e-mail me directly by clicking here . Now the long, i.e. why I am asking for YOUR participation, as a scientist, and/or an archaeologist. As per my previous blog entry I have been personally visiting archaeologists, or more occasionally, have had them visit me for Q-sort. However I need about 30 participants to improve the validity of my research, though one of the advantages of q methodology is that small rich analysis makes up for a relatively small number of participants, i.e. it is more qualitative than quantitative for data gathering, with quantitative techniques applied to the qualitatively obtained data. 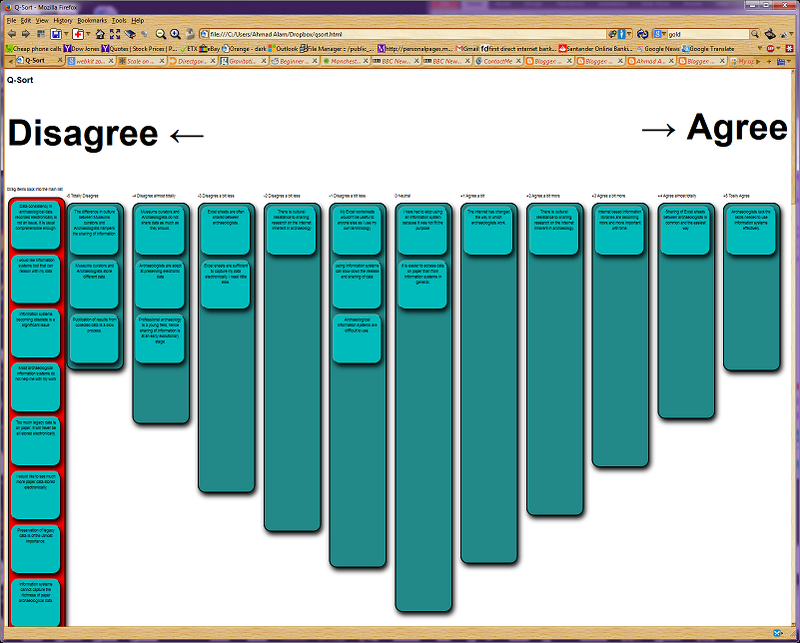 All this entails is the ranking of 58 statements depending on how agreeable or disagreeable they are. This should take no more than an hour to complete, but more than 30 minutes in most instances. Obviously I will eventually publish my results, with the data available on request, anonymised of course. The following is what the current prototype looks like. Additionally to further broaden my research, the addition of Q-sort survey data relating to attitudes to data sharing from scientists, who lie outside the archaeological community will provide two major benefits. In the first instance it will provide an insight into whether issues that are identified as pertinent barriers to information sharing within the archaeological community are confined to their community, or whether they are issues common to other scientific disciplines. The other benefit will be that it will be useful standalone study into issues that hamper the sharing of scientific data. For reference or those who those who haven’t seen the slide I presented, here it is. I presented the new direction my work had taken, i.e. 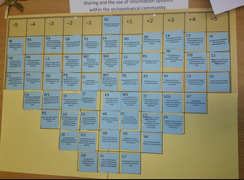 researching attitudes to data sharing within the archaeological community with a view to integrating and sharing archaeological data, at the ArchSci Symposium that was held at the University, November 2013. My presentation was in effect a pitch made to archaeologists to participate in a Q-Sort, a card sorting exercise based on Q-Methodology. Here's an example of one completed by a participant. The details are deliberately not clear so as to ensure that new participants approach it not knowing the specific statements on the cards, even though the placing of the cards will be based on a participants subjective opinion of their agreement, or otherwise, with the statements on the cards being placed. Hence advanced knowledge is unlikely to create any bias in the study, but I've decided to err on the side of caution. I presented a poster detailing my work on MEPR and received some interesting feedback from the visiting dignitaries. I was speaking to an academic and I mentioned that it is not uncommon in the archaeological community for papers to be published years after the initial research has been done, i.e. after a dig for example. His reply was that this should not be considered unreasonable, as they have to work on lengthy time-scales. He mentioned a dig in what was effectively in an Arctic wasteland in Scandinavia (the country was named, but I cannot be sure which it was). It took ten years to gain government approval for that dig, hence having waited ten years for permission to dig, taking another one or two to publish the results is not unreasonable. Another interesting point made by an industrial dignitary was that of whether I had looked into the issue of the longevity of electronic media, i.e. optical discs (DVD, CD etc.). My answer was that it has been an issue that I have recorded, particularly where data kept on old floppies discs (5.25", 8" etc.) was lost due to people no longer having the means to read such media. However it was a good reminder to consider the lifespan of optical media, and hence this issue was taken up in my paper, Mummies on Rails. However the main focus of my research with regards to data handling was more application centric; legacy systems written in obsolete languages, and/or with no source code available. For example I came across an application written in Delphi (an old evolution of Pascal) that had a user interface that one set of archaeologists thought was unusable, but would be very difficult to modify to address their issue with it. Hence they simply chose not to use it. If you don't know what Pascal is, it was an effective teaching language in the 80's, that lost out to C, (C++ etc.) and Java. I might upset some with my description of it as a 'teaching' language, as it stole a march on the Basic's of that area (the more common predecessors of Visual Basic), but rest assured I knew of its use in industry. Eurostar used it, as did Shell Oil. The latter used it on a VMS pipeline monitoring system, I know this because I worked on it for a number of years. I own a working USB 3.5" floppy drive, last year I tried to copy my dissertation work off it. Despite being over 15 years old it all worked. Problem is that only the data was on the floppies, I couldn't read the actual dissertation off the CD's I backed it onto as the sessions were never 'closed'. CD's were expensive and I wanted to use the rest of the space at some later date. My modern burner won't read what's there properly, and won't close the session either. However I have a bound copy, and loose leaf printed copy. Last but not least, it's in the university library too. I am currently alive, unless I have died, in which case no one is likely to update this.